The Mountaineers started their Big 12 play at home against the Kansas State Wildcats on Saturday, Oct. 1. After being down by 13 points in the third quarter, West Virginia was able to mount a comeback and win the game 17-16. 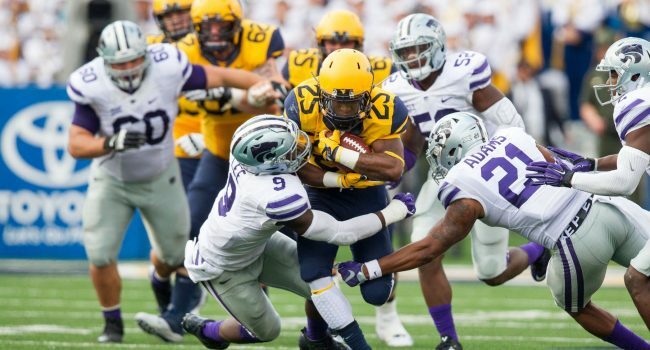 Since joining the Big 12, the Mountaineers have not been able to defeat the Wildcats. After 4 years of defeat, West Virginia was finally able to end the streak. This was definitely a rollercoaster of a game for the fans, but the night ended with Country Roads. The Mountaineers started off slow on offense again, not taking advantage of certain situations. The defense was able to stop the Wildcats on their first possession, giving West Virginia a great opportunity to take advantage and strike first. A decent drive, however, ended up in a missed 30-yard field goal by Josh Lambert. The WVU defense held up with a 3-and-out following the missed field goal, but the offense failed with a Skylar Howard interception the first play into the drive. With a short field, the Wildcats took advantage and scored a touchdown to take a 7-0 lead and the first quarter concluded shortly after. The second quarter was a battle of the defenses. Going into the game Kansas State was viewed to have one of the top defenses in the nation. West Virginia’s defense had shown moments of promise in the previous 3 games, but this was definitely their toughest battle. The second quarter was a series of punts with 2 Wildcat field goals in the mix. The Mountaineers headed into the half trailing 13-0. West Virginia started the second half with the ball, hoping to bounce back from a slow and lousy offensive first half. After a good looking drive, the EERs capped their first series in the third quarter with a field goal. Kansas State answered back with a field goal following a 58-yard kickoff return and a short drive. Things were looking up for the Mountaineers next drive, but unfortunately ended with a Rushel Shell fumble on the Kansas State 2 yard line. Now with an unsettled and disappointed crowd, the defense had work to do. They answered the call and forced a Kansas State punt. The Mountaineers were down by 13 at the end of the third quarter. The Mountaineers started the fourth quarter with possession, looking to finally get in the end zone. The drive started with a huge pass from Skylar Howard to Shelton Gibson for a 52-yard gain. From there Jordan Crawford worked away and ended the drive with a 1-yard touchdown run, making the deficit 6. WVU defense showed up yet again on the following drive with a Rasul Douglas interception. The EERs were not able to capitalize on the turnover but still gave Kansas State a long field to work with. After Wildcats punted, West Virginia needed a scoring drive with the time ticking away. The offense did just that and drove down the field and scored a touchdown to take a 1-point lead. With 2 minutes remaining, the only thing that stood in their way of victory was a 43-yard field goal. 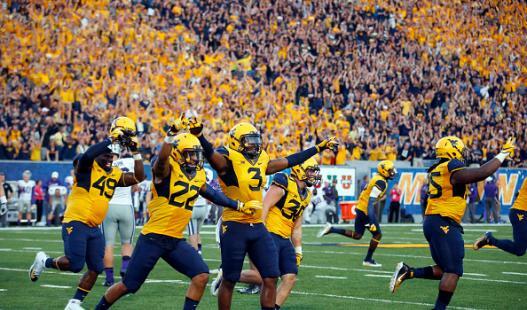 With the Mountaineer faithful roaring and pressure increasing, Matthew McClane shanked the field goal and West Virginia took possession and ran the clock out to victory. There are plenty of things to take away from this game, both positive and negative. To get the negative out of the way, the offense has to start games in a much quicker manner. They won’t be able to keep up if they continue that trend. Also, the bad turnovers need to end and the offense needs to capitalize every chance they get. The positives on the other hand are great. To me, for the first time this season, the defense was completely dominant. They looked in control and only allowed 1 touchdown, which was on a very short field. The most important positive – and what I love about this team – is the poise and will to win they have. With the controversy they faced during the game, they kept fighting on both sides of the ball. That fight is what won the game. It was a stressful but very exciting Mountaineer win. With a bye week coming up, they have time to prepare for an explosive Texas Tech offense for their first true road battle. If the defense continues the trend and the offense plays as well as they should, I see 5-0 in our future. Andrew Bradfield is a senior sport management major at West Virginia University. As a Warrenton, Va., native, he's a diehard D.C sports fan. He enjoys hanging out with his friends, playing sports, going to Mountaineers games, and being outdoors. He's also always ready for an adventure and likes to try new things.